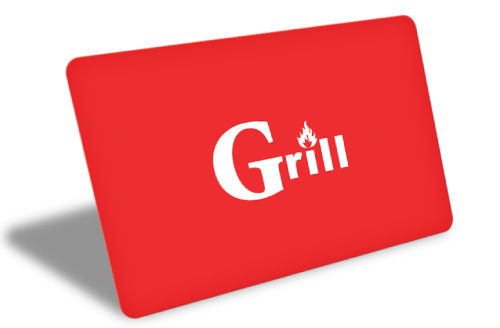 Input the dollar value for your Grill card purchase and press the Enter key. Gift cards are redeemable in restaurant location specified on front of gift card only. This gift card not available to print online, but will be mailed to the location specified in the checkout process. Cards are available for immediate purchase in all restaurants during normal business hours. All gift cards mailed on next business day via USPS. Input the dollar value for your Eat With Us card purchase and press the Enter key. Choose between a dedicated Grill gift card or an Eat With Us gift card. 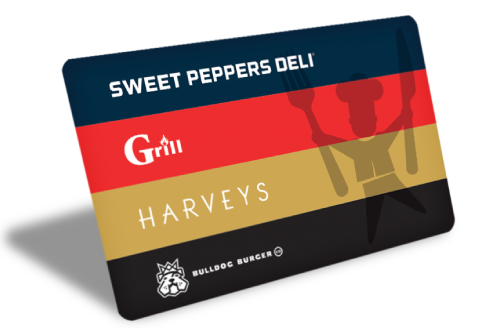 By choosing the Eat With Us gift card, the recipient will have the option to use the card at any Smackers, Sweet Peppers Deli, Harveys, Grill, Bulldog Burger Co and Smackers location. Online ordering coming soon. Check back to order your favorite Grill dishes.